Since getting a 12.9-inch iPad Pro last year, I've had a fairly troubled relationship with external iPad keyboards. I didn't like the original Logitech CREATE keyboard case, so, surprised by the lack of notable Smart Connector-based accessories, I ended up using an Apple Magic Keyboard for the majority of 2016. 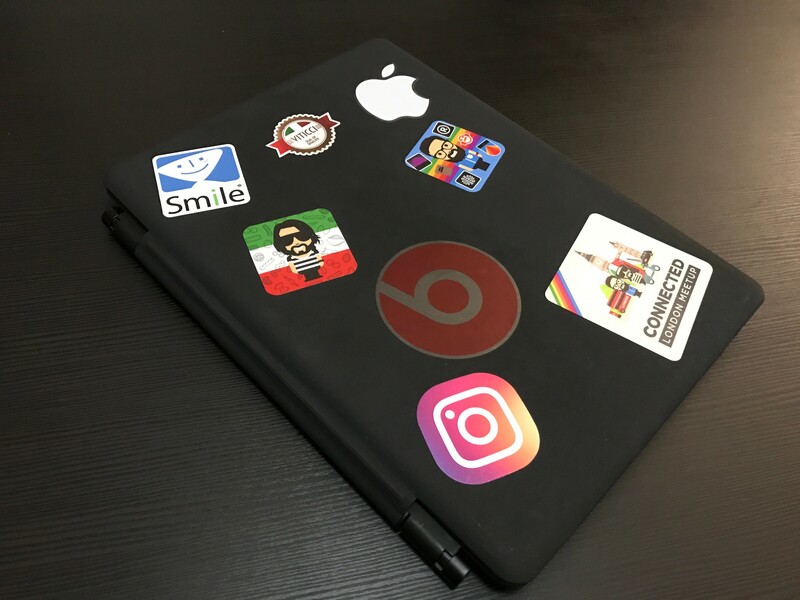 As I wrote in my original review in November 2015, while I appreciated the CREATE's easy pairing and backlit keys (both facilitated by the Smart Connector), the quality of the case, its cheap plastic buttons, and the difficulties I had in getting the iPad Pro to fit into the case were enough to drive me away from Logitech's hardware and consider other options. For a few months, I went back to typing on my iPad without a physical keyboard, using the software keyboard in combination with TwelveSouth's ParcSlope1. As I started working on my iOS 10 stories in April and knowing how my priorities would change after WWDC 2016, I realized that the amount of writing ahead couldn't happen with the iOS software keyboard alone. Thus, after four months of typing on the software keyboard, I caved and bought a Magic Keyboard and used it alongside a (still unreleased) iPad stand for the whole summer. My iOS 10 review was entirely written and edited on the Apple Magic Keyboard, which held up well in three months of intense typing every day. The problem with the Magic Keyboard is that, because it's a desktop accessory, it's not designed to be carried around and used with an iPad Pro propped up on your lap. Sure, you can do it, and I've been doing it often, but it's uncomfortable at best. 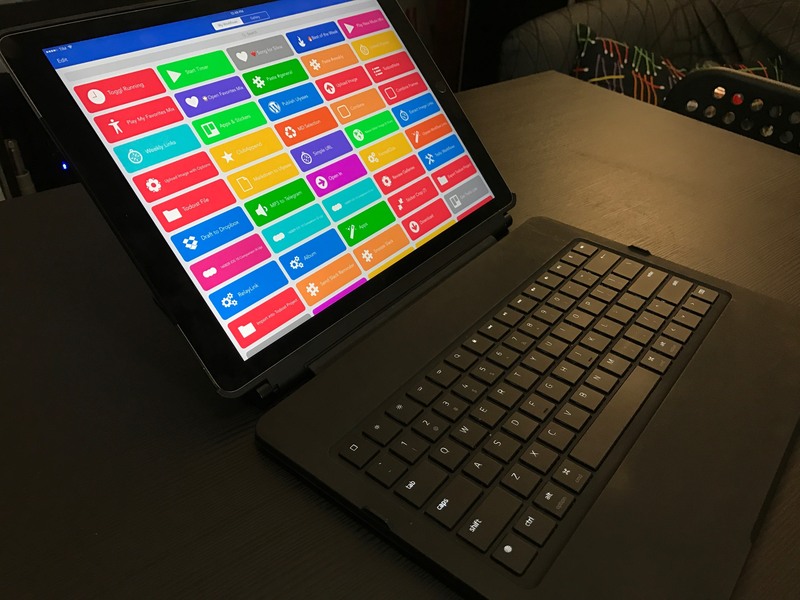 The tipping point for me came in September: after more personal schedule changes, I realized that I would have to do more driving and waiting in my car every week, and I knew I had to find a better keyboard setup for my iPad. 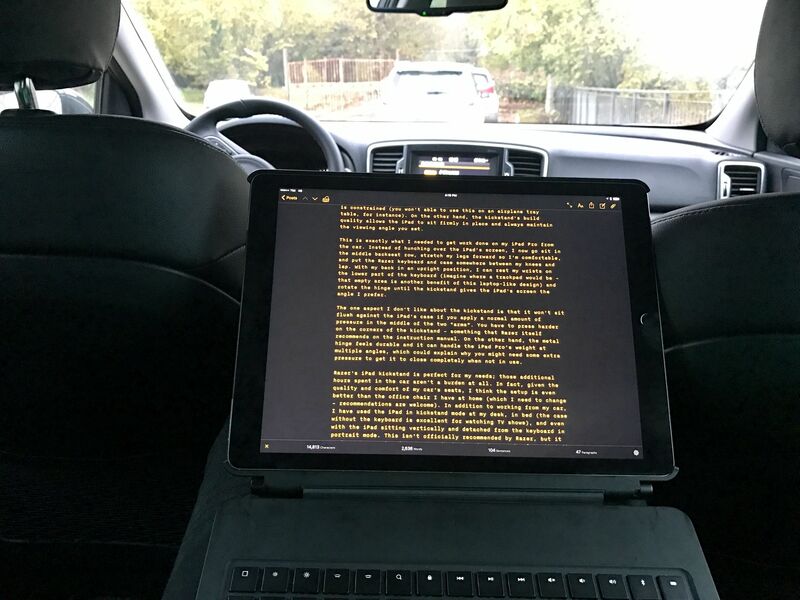 With a total of six hours to spend every week in my car trying to work while sitting and waiting, neither the software keyboard nor the clumsy Magic Keyboard were going to cut it. After some research and despite its less-than-stellar reviews, I bought a Razer mechanical keyboard case for the iPad Pro. I've been working with this keyboard for over a month now, and not only am I more efficient because of it – my back doesn't hurt anymore and I'm typing faster than ever. Every week on Monday and Wednesday, I have to wait three hours (each day) in my car before I drive back home. While that may sound uncomfortable, I actually find my new car (a Kia Sportage 2016) a great place to get work done: the back seats are large, there's Bluetooth audio, good AC, and, best of all, silence when I need to concentrate.2 I quite enjoy working with no interruptions from my car, but I needed to find a keyboard case that would transform my iPad into something similar to a laptop without the caveats of the Logitech CREATE. Razer's mechanical keyboard case is made of two distinct parts: the actual Bluetooth keyboard (which is backlit and has low-profile mechanical switches) and a hard plastic case where you insert the iPad Pro. Both can be attached through a magnetic strip that protrudes from the keyboard and connects to the longer side of the case. Unlike the Smart Keyboard, you can detach the iPad and use the keyboard via Bluetooth while the device is farther away from your eyes and hands. The case features a hinge at the bottom where you'll find the magnet to align and snap the iPad to the keyboard. Because the keyboard's magnet is attached to a soft strip that ensures the iPad can close on top of the keyboard, the whole magnetic attachment feels a bit flimsy and, to an extent, cheap. The magnet may move and jiggle, and it doesn't look nice when doing so. I wish Razer had come up with a more elegant solution that combined the docked case/keyboard position in both typing mode as well as cover mode. The current solution feels a little odd. The core aspect of Razer's case, however, isn't how it attaches to the keyboard, but, rather, its adjustable metal kickstand. Unlike keyboard cases or covers that limit you to a fixed viewing angle, Razer's kickstand can be adjusted, giving you the flexibility to prop up the iPad on different types of surfaces and in different writing contexts. 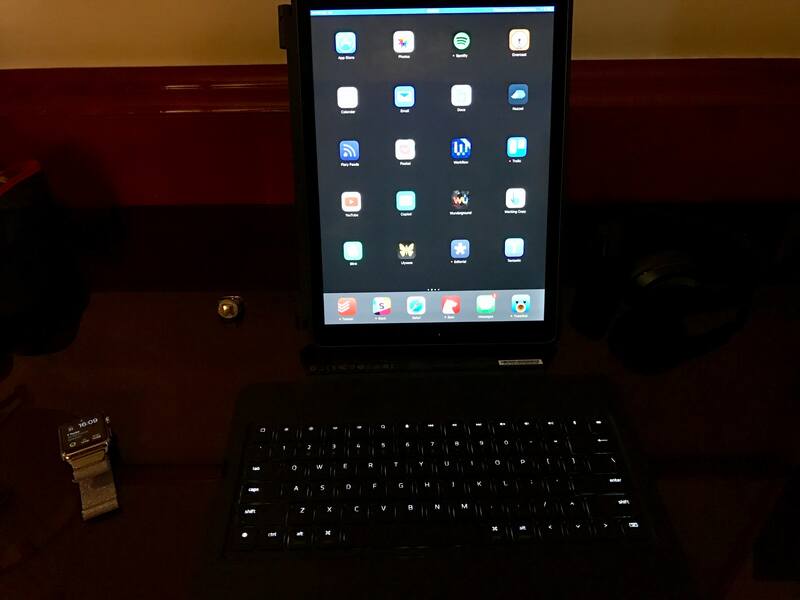 The kickstand yields a larger and longer footprint than other iPad keyboard cases, which can be an issue if your space is constrained (you won't able to use this on an airplane tray table, for instance). 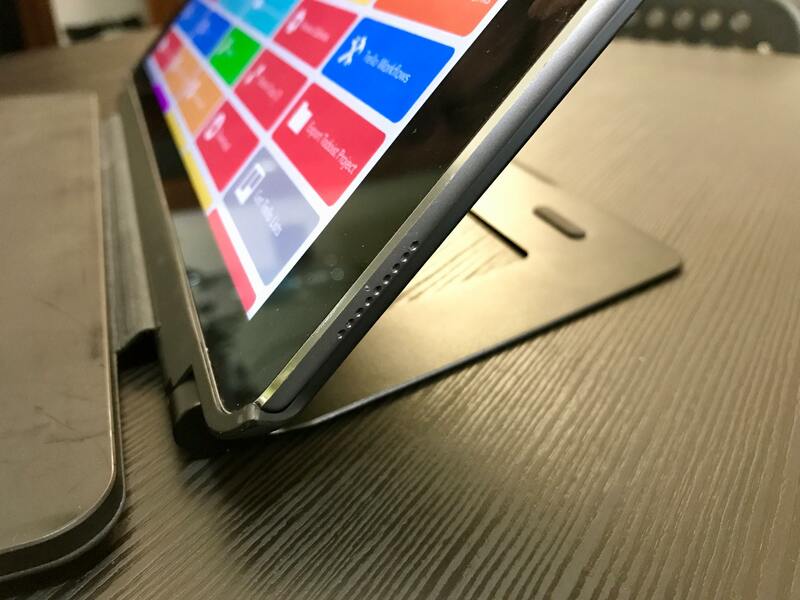 On the other hand, the kickstand's build quality allows the iPad to sit firmly in place and always maintain the viewing angle you set. The kickstand's base has a notable footprint behind the iPad Pro. This is exactly what I needed to get work done on my iPad Pro from the car. Instead of hunching over the iPad's screen, I now go sit in the back seat, stretch my legs forward so I'm comfortable, and put the Razer keyboard and case somewhere between my knees and lap. 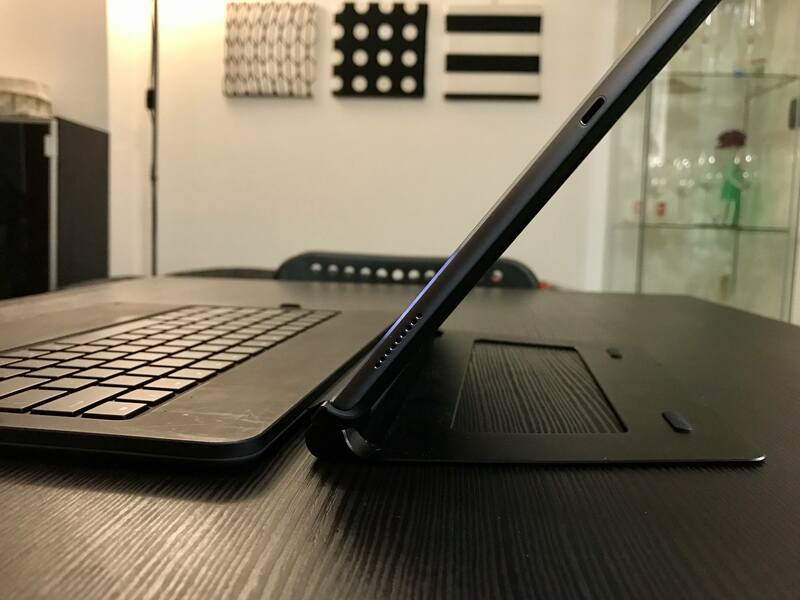 With my back in an upright position, I can rest my wrists on the lower part of the keyboard (imagine where a small trackpad would be; that empty area is another benefit of this laptop-like design) and rotate the hinge until the kickstand gives the iPad's screen the angle I prefer. The one aspect I don't like about the kickstand is that it doesn't sit flush against the iPad's case if you apply a normal amount of pressure in the middle of the two "arms". To close the kickstand, you have to press hard on its corners – something that Razer itself recommends on the instruction manual. It feels like you're going to break it every time. The back of the Razer case shows how the kickstand doesn't sit flush on the surface without a good amount of pressure. However, the metal hinge mechanism is durable and it can handle the iPad Pro's weight at multiple angles, which could explain why you might need some extra pressure to get it to close completely. That's a trade-off I can live with if it means the kickstand can sustain my iPad Pro reliably over time. 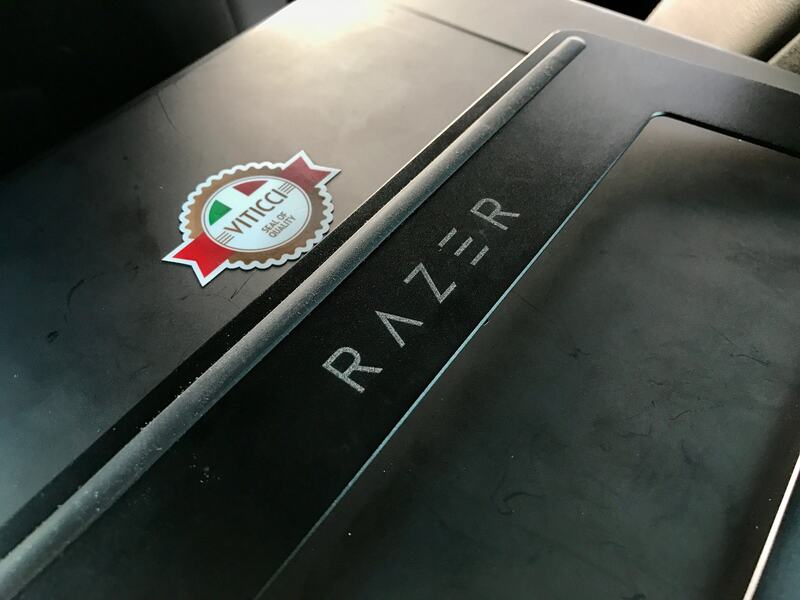 Razer's iPad kickstand is perfect for my needs – with it, those additional hours spent in the car aren't a burden or a loss of productive time. In fact, given the quality and comfort of my car's seats, I think the setup is even better than the office chair I have at home (which I need to change; recommendations are welcome). A good portion of MacStories Weekly is assembled in the hours I spend waiting in my car. In addition to working from my car, I have used the iPad in kickstand mode at my desk, in bed (the case without the keyboard attached is also excellent for watching TV shows), and even with the iPad sitting vertically and detached from the keyboard in portrait mode. The latter isn't officially recommended by Razer, but it works as a way to view more content when typing; I love that the metal kickstand handles the different orientation without issues. I have done this, and it works. You probably wouldn't expect a kickstand to be the selling feature of an iPad keyboard case, but it is the primary reason why I bought the Razer keyboard. Together, the keyboard and the kickstand transform the iPad Pro in a laptop that runs iOS and I can use anywhere. The Razer case and kickstand have their caveats, but they're what I needed to get more out of my iPad Pro. If you listen to Connected, you know I don't have a particular affection for wires and mechanical keyboards. I have typed on several keyboards over the past seven years, and I always got used to the feel of the keyboard I was using without too much drama. If I were to get some writing done during a flight right now, I'd probably bring a Smart Keyboard with me. The way I see it, my priority is getting words that make sense on the screen – not obsessing over the key travel of a keyboard and being too precious about it. That said, the low-profile switch used by Razer feels nice and makes a pleasant sound when pressed. I'd still use this keyboard if it had keys as flat as the Smart Keyboard or the MacBook, but I like what Razer built. There are some oddities. First, the case's texture is a dust magnet and I wish Razer offered more color options that would better hide dust and help clean the keyboard less frequently. Second, I bought the keyboard from the Italian Razer store, but I got one with an American layout. I was upset initially, but I got used to the differences in about a week and, frankly, I think not having Italian characters and keyboard conventions is better for me at this point given the amount of English writing I do on my iPad.3 Still, that's something worth considering if you absolutely need a keyboard layout in your native language. Last, and perhaps more perplexingly, Razer has adopted a peculiar placement for the arrow keys. They are full-size, which is nice, but the right arrow key sits next to the keyboard-dismiss key. This is downright infuriating at first because you'll mistakenly hit 'Dismiss' when reaching out for the arrow in the corner of the keyboard, and instead you'll be presented with the iOS software keyboard appearing on screen. I understand that Razer had to include this key for integration purposes with iOS4, but I would have preferred if the arrow keys extended all the way to the right edge and the software keyboard key was placed on the left side, next to the globe key used to cycle between keyboard layouts. Because of its full-size layout, mechanical switches, and backlight illumination, I've noticed that I've been typing faster and more often on the Razer keyboard than other keyboards I used in the past. Being able to attach a kickstand and the backlit keys have helped me type from anywhere – whether it was in my car or in bed at night – and I find typing on this keyboard a pleasure compared to the Smart Keyboard and Magic Keyboard. There isn't much to say about the case and the rest of the keyboard. The case and kickstand add a lot of weight to the iPad Pro and they're definitely not meant to be used as a traditional protective case, or even as a stand to prop up horizontally the iPad and type in software keyboard mode. The iPad Pro alone weighs 723 grams: with the Razer case and keyboard, it goes up to 1710 grams – nearly an extra kilogram. The back of the keyboard has a grippy texture that makes it not slide across tables and desks, but it's boring to look at when it's closed, so I covered it in stickers. I think we can all agree it looks much better this way. Finally, while there are magnets in the lower edge of the keyboard to align it with the front of the iPad when closed, the whole structure doesn't feel as tight as the Smart Keyboard. This is largely due to the flexible strip that connects the keyboard and case, but I don't particularly mind as I've been carrying everything in my Daylight Briefcase bag; the iPad's case and the keyboard never disconnected from each other. Using the Razer keyboard every day exacerbates iOS' shortcomings in the external keyboard department. This is nothing new, but I notice the issues more now as the bigger surface makes my hands rest farther away from the screen; every time I have to interact via touch, it is extremely annoying. Many apps still don't support basic shortcuts such as CMD-F to focus the cursor in their search field, or CMD-N to create a new document. iOS will probably never have the kind of keyboard control possible on macOS because of its multitouch nature, but there's still a lot Apple can do to improve the current implementation of external keyboards. Working with the Razer keyboard in iOS 10 is dramatically better than what we used to have until a couple of years ago, but I'm hoping to see additional changes in this area with iOS 10.3 and iOS 11 next year. As a heavy iPad Pro-only user, this is the keyboard I wanted. I happen to be exactly that kind of iPad user. 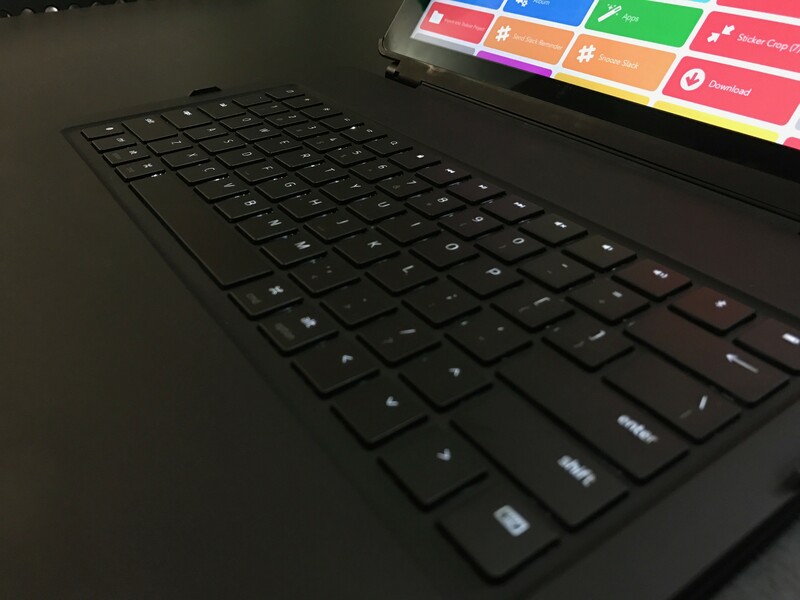 This keyboard has flaws and questionable design decisions – you could argue that it doesn't even look nice – and I wouldn't recommend it to anyone looking for a entry-level iPad keyboard case or standard Bluetooth keyboard. However, despite the things Razer could have done differently, the functionality of the kickstand-keyboard combo is unparalleled. As a heavy iPad Pro-only user, this is the keyboard I wanted to work faster and more comfortably from anywhere. The Razer mechanical keyboard case is my new favorite way to type on the iPad Pro. It's not for everyone, but it's just what I was looking for.